Aside from French sweets, Gourmet France is known for its cheeses. So crazy are the French about their cheeses that there are around 400 distinct types of French cheeses grouped into 8 categories. Since it would take forever to go through every single type of cheese, here are the 10 tastiest cheeses from different French cheese regions that every aspiring French cheese connoisseur needs to know. Considered as one of the best-known cheeses in the world, brie is a type of soft cheese that becomes softer as it ages. Named after the historic region in Northern France where it’s mainly produced, brie has a rich milk and buttery flavor that makes it perfect to eat with bread and paired with either red or white wine. Named after its birthplace in Camembert, Normandy, Camembert is another type of soft creamy cheese that the French absolutely love. Made with raw cow’s milk, Camembert has an earthy flavor that is similar to brie, only a bit stronger. This creamy cheese is made in the Haute Savoie Alps region and is one of the more popular grand mountain cheeses readily available in markets today. Made from raw cow’s milk, Reblochon has a strong aroma with a nutty aftertaste. Made in the village of Cleron in the Franche-Comte region, Edel de Cleron is a traditional cheese made from pasteurized cow’s milk. This soft cheese, known for its woody aftertaste, is best eaten ripe when it’s runny and gooey on the inside. The Delice is a type of cheese that is made in Burgundy. Since cream is added in twice with the milk during the cheese-making process, this cheese is rich and exceptionally creamy that you’ll feel it melting in your mouth. Produced in the Eastern region of France, the Morbier is a type of semi-soft cheese that can be made from either raw or pasteurized cow’s milk. The Morbier has a tangy flavor with a hint of citrus and is also fairly elastic. Known as one of the oldest cheeses from Normandy, the Pont-L’Eveque is the only semi-soft cheese with a cross-hatched pale orange rind. Made from raw cow’s milk, it has a creamy smooth texture and a fairly strong pungent aroma. Traditionally produced in the city of Lille, the Mimolette is a type of hard cheese with a bright orange color and comes in the shape of a cantaloupe. When properly aged, this cheese has a nutty flavor and makes a great addition to any cheese platter. Also known as the Gruyere de Comte, the Comte is a delightful hard French cheese with a smoky yet fruity taste. Made from unpasteurized cow’s milk and produced in Eastern France, this versatile cheese is usually melted to make fondue, eaten as a sandwich, or grated over savory dishes. Known as one of the most popular blue cheeses around, the Roquefort is made from sheep’s milk in the south of France. Similar to the Bleu d’Auvergne, the Roquefort is a rich, creamy, sharp cheese with a pungent aroma. 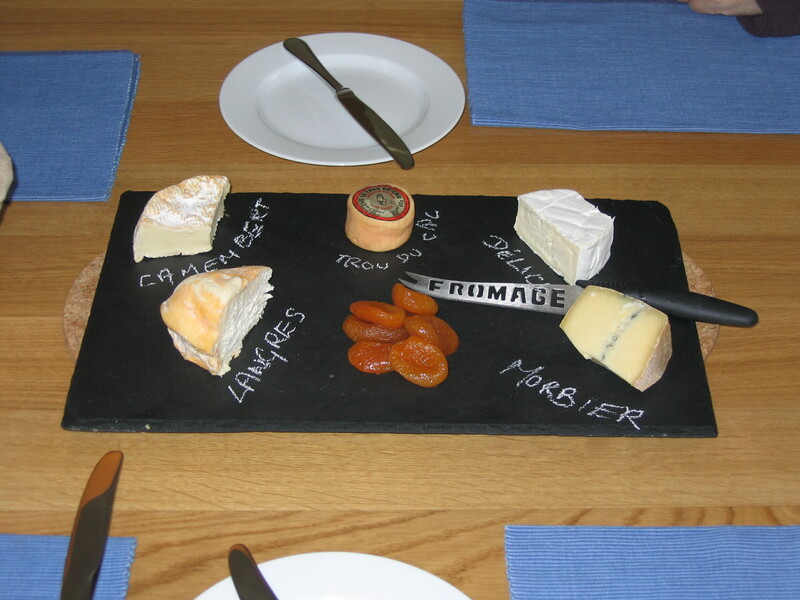 Taking a barge cruise through the canals of France will give you a chance to taste many different cheeses. The cheeses will be accompanied by complementary wines of the regions as well as great food. Barge cruises range in price from low $3,000’s to over $7.000 per person for 6 nights. Rate includes the cruise, all meals, most non-alcoholic and alcoholic beverages and excursions. All barges include bicycles for cycling the towpaths along the canals and exploring the nearby towns and villages. Check out our site to learn about the different barges we offer. For more information contact: jan@europeanbarging.com or 888-869-7907 Barge and River cruise specialist since 1998. 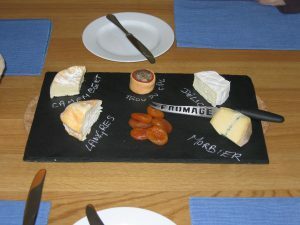 This entry was posted in Advice, European Barging & River Cruises, France and tagged Burgundy France, Cheese Cruise, europeanbarging, France Cruise, Gourmet French Cruise, luxury barge cruise, Wine Cruise by Jan European Barging & River Cruises. Bookmark the permalink.